A bee or wasp problem in your home or yard can disrupt daily life and put both you and your family in danger. If a family member is allergic to a bee and is stung, the reaction might be serious enough to warrant a trip to the hospital. A bad reaction can occur even if the allergy had previously been non-existent or mild. Also, an individual’s allergy can worsen after repeated exposure to bites. Multiple bites can be quite dangerous, especially with regard to the elderly or small children. Regardless, bee stings hurt even without an adverse reaction. If you want to make sure that bee or wasp stings do not pose a danger to you or your family, let a professional exterminator address the problem. 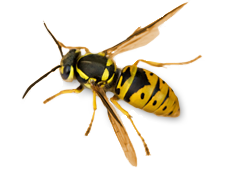 Exterminating bees or wasps on you own can be difficult and even dangerous. Sometimes a homeowner will attempt to exterminate pests alone, using chemical sprays from a hardware store or supply center. If these sprays are not applied in the correct locations, most of the bee or wasp colony will survive. the most challenging nests to control are those that are located deep inside the walls of a home or in the attic. Often, a homeowner does not even know where the actual colony is located. He or she only sees where the wasps are flying back and forth through a crack or hole in the home. a professional exterminator will know exactly where to spray in order to eliminate your bee or wasp problem for good. Outdoors, bee and wasp nests near human activity can pose a potential problem. some wasps may become aggressive scavengers around human food and are attracted to outdoor activities where food or drinks are served. Most bees and wasps will not attack if left alone. However, some people are curious to observe a nest or unknowingly surprise a member of a hive. If provoked, a bee will sting in defense of its nest of itself. Insect sprays should be used with caution. some of the more caustic over-the-counter sprays on the market can cause harm to children and pets. A professional exterminator knows which sprays to use that will not harm any of you loved ones. If you attempt to exterminate pests yourself, you could literally spend hours shopping for costly pest control sprays or trapping devices. You could then spend even more time trying unsuccessfully to kill the wasps or bees, putting yourself or your family at risk in the process. A professional exterminating service can take care of your pest problem efficiently. Exterminators train or apprentice before they begin working independently and know a great deal about insects and insect removal. Contracting a professional exterminator can save you both time and money. The sooner you call a licensed exterminator, the sooner your family’s home and lives can return to normal.